For Robin Sizemore, International Adoption is not just a career; it is a way of life. While she has been an Adoption professional since 1995, she also is the adoptive mother of a child from the Republic of Georgia. This personal interest has led her to build an agency in a field where trust is the most important commodity. Keeping that trust with families and children has led Hopscotch to become a Hague Accredited child placement agency, and often requires her personal involvement in humanitarian issues in the countries they serve. Since its inception, Hopscotch has developed programs in Georgia, Armenia, Bulgaria, Ghana and Morocco. That trust and respect led to Robin’s selection as the first recipient of the Donna Newton Executive Director Academy Scholarship. 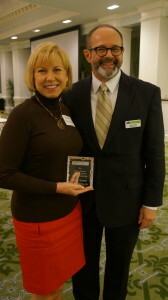 Robin received her award at the Celebration of Nonprofits on November 6th at the Greensboro Country Club. The scholarship was established by the Guilford Nonprofit Consortium Steering Committee as way to honor retired Director Donna Newton. The award seeks to honor an Executive Director who has demonstrated a commitment to learning and has given back to the Guilford Nonprofit Consortium in a substantial way. During 2014, Robin presented two workshops for fellow Consortium members on protecting the online reputation of the nonprofit organization. Her own experience in the politically charged world of international adoption provided her with a blueprint that she shared freely with the Consortium in the well-attended seminars. The recipient receives a full scholarship to the nine-month Executive Director Academy at the Center for Creative Leadership. The Academy is also sponsored by Discovery Learning, another veteran support of the Consortium. During the Academy, selected directors of nonprofits receive valuable Leadership training, at CCL, peer mentoring from other participants and one-on-one coaching from an experienced nonprofit leader.